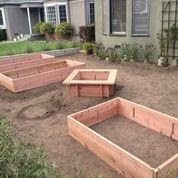 One of the garden owners always loved gardening and dreamed of having her own yard to transform. That opportunity presented itself when her family moved into their new house in the fall of 2012. After making the house livable, she set to work on their yard. They considered hiring a landscape designer but, after giving it some thought, decided that it was a project they could manage on their own. As an artist, she has a keen sense of design and style, and loves a good challenge. Her mission: create a beautiful, drought tolerant, semi-private sanctuary for both her family and wildlife—especially honey bees, for which she has an inordinate fondness. The first order of business was to build a wall so to create separation from the street and then level the yard. Work on the wall began in December 2012 but, with all the rain we had last winter (remember that!) it wasn’t finished until the end of January. She spent that winter researching plants and designing the layout. 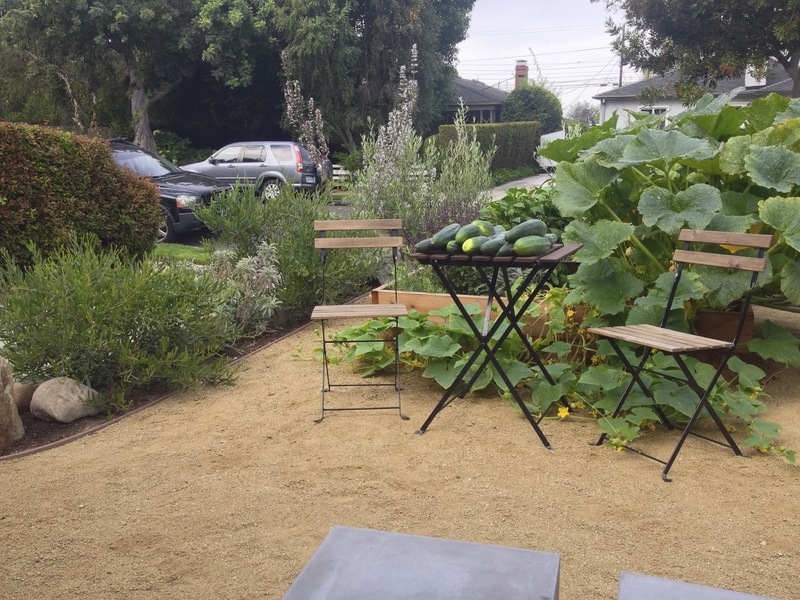 They wanted border plants that would parallel the sidewalk to provide some privacy and flowering drought tolerant plants along the driveway, leaving the center of the yard for raised vegetable beds and a lounge area for relaxing and entertaining. By the end of February, 2012, she completed an organic gardening course at SMC Community Education taught by Christy Wilhelmi and was ready to begin planting. the driveway. 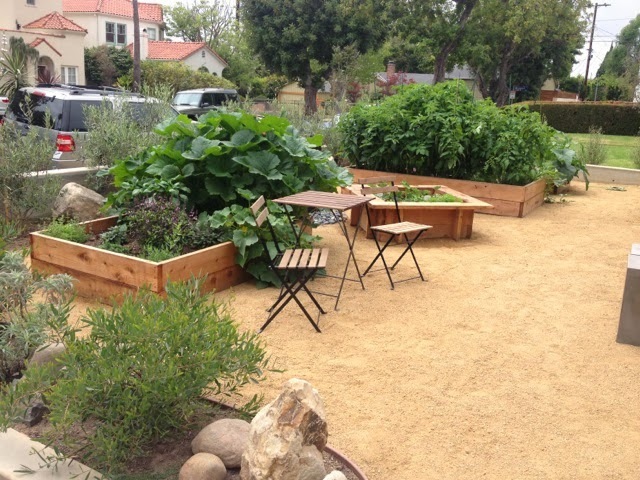 In the center they built four raised vegetable beds and used decomposed granite as the surrounding ground cover. They installed a basalt fountain that would be easy for the bees and birds to drink from. They had drip irrigation installed in the upper yard but decided to choose very hardy plants that would need minimal hand watering in front of the wall and in the parking strip. In front of the wall she chose Lantana and lavender both for their hardy, drought tolerance and because they are a favorite of both bees and butterflies. In the parking strip she did some experimenting and had mixed success. Lavender, rosemary, butterfly bush, bees bliss sage, pincushion flowers and purple cone flower are a few of the plants she’s tried. She considers this experimental garden area and will continue to try new plants. she’ll will add some edibles this spring. Since there is no irrigation in this area she waters exclusively by hand. Over the past winter she’s only needed to water monthly. Finally by May the vegetables were planted and much to her delight within six weeks they were flourishing beyond her wildest dreams. The front yard is an enchanting haven for both the family and a diverse variety of wildlife. It provided them with a bounty of organic vegetables all summer and well into the fall. In 2013 she planted a winter garden. The family is enjoying the abundance Southern California affords a gardener! They are filled with gratitude. Christy Wilhelmi, an edible garden expert and owner of Gardenerd, will be at the garden and copies of her new book, Gardening for Geeks, will be available. Printed tour maps will also be available.